Ah, homemade bread. There’s really nothing quite like it. Slathered with fresh butter, or homemade jams, or honey, it’s the ultimate comfort food. 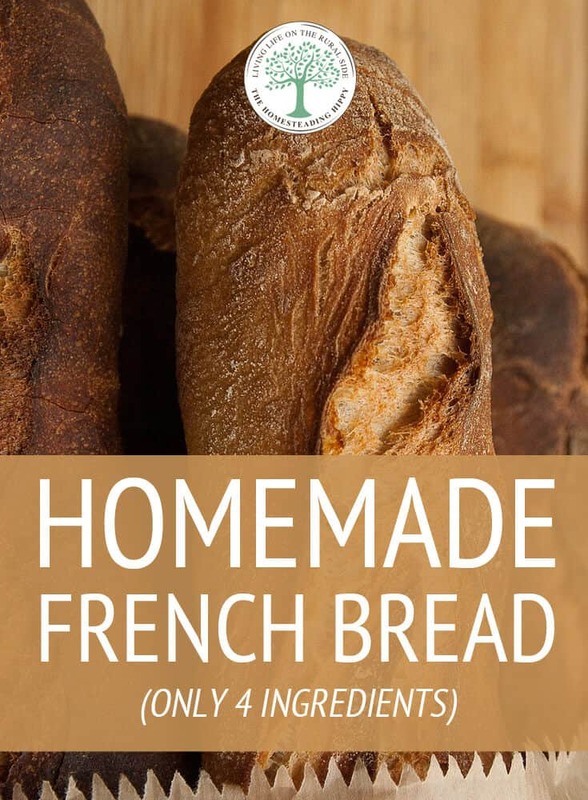 I love making all different types of bread from honey wheat, to sourdough and also this amazing French bread. Bread was so important, that back in the 1700s, a Frenchman was said to eat 3 pounds a day. If bread supplies ran short, or the quality was bad, riots resulted. There were even changes in the very language that reflected bread’s importance, the English phrase of: “to be the bread-winner” was made common to flaunt their victories over French territories. It truly was the “bread of life’. During the Middle Ages, breadmaking was primarily done at home, but more and more, people took their dough to be baked at a local bakery. This was done with a wood-fired oven, and using long handled paddles to move the bread in and out of the oven. 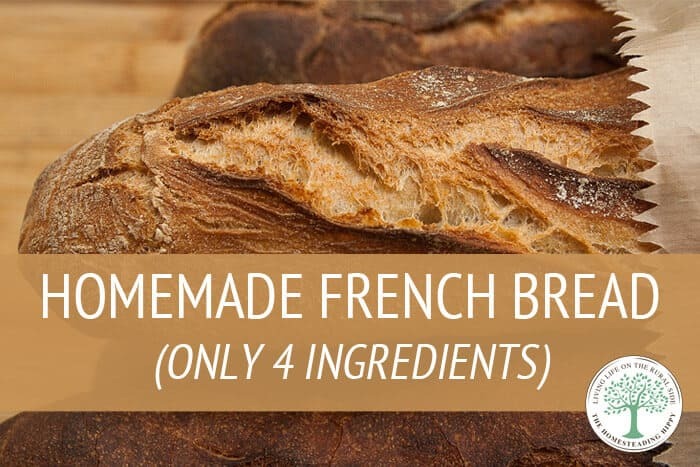 True “French bread” has only 4 ingredients, yeast, flour, salt and water. This recipe is truly great for the homestead, as it requires little ingredients to be stored. The kneading techniques traditionally used with this is what brought about a great flavor and rise. Today, I use a stand mixer to get the same results. If you want "authentic", you will need to knead the dough for 7-10 minutes in order to develop the gluten and get a fluffy loaf. Dissolve the yeast in 1 cup warm water. Add the salt to the flour, and add in 1/2 cup increments while mixing. Knead by hand or mixer for about 10 minutes. Let rise in a warm place until doubled, about an hour. Punch down, and shape into loaf, and using a sharp knife, slice carefully down the middle of the loaf, about 1/4″ down. I sprinkle the bottom of the baking sheet with a bit of cornmeal to help keep it from sticking, as well as add an interesting crunchy factor. Allow to rise 30 more minutes and bake in oven at 350 degrees for 30 minutes. You will want to put the bread in a cold oven, set the temp, and then the timer. As the oven warms, it gives the yeast a bit of help rising and this is called "spring".